This is a guest post by Siobhan C. Hagan reporting on the Memory XFR event hosted by the American Folklife Center and the DC Public Library. Siobhan is the Memory Lab Network Project Manager at DC Public Library, where she leads the IMLS National Leadership Grant project to embed digital preservation tools and education in public libraries across the United States, following the model of the DCPL Memory Lab. Siobhan holds her M.A. in Moving Image Archiving and Preservation from NYU’s Tisch School of the Arts and has worked in a variety of collecting organizations throughout her career, including the UCLA Library, the National Aquarium, and the Smithsonian Institute. In addition to this, Siobhan is the founder, CEO, and President of the Mid-Atlantic Regional Moving Image Archive (MARMIA). She has been regularly active as a member of the Association of Moving Image Archivists (AMIA), currently acting as co-chair of the Local TV Task Force and previously acting as chair of the Regional Audio-Visual Archives Committee from 2013-2018 and as an AMIA Director of the Board from 2015-2017. On Friday, August 24, 2018, the Library of Congress’ American Folklife Center and the DC Public Library partnered to put on Memory XFR (pronounced “transfer”), a one-day pop up program at the DCPL’s Memory Lab assisting local organizations and individuals in the transfer and care of archival formats such as VHS, VHS-C, S-VHS, MiniDV, DVCAM, audio compact cassettes, slides, negatives, and photos. 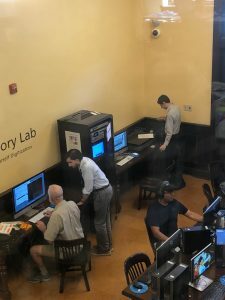 While DCPL’s Memory Lab allows for users to independently sign up for 3 hour slots to use its equipment other days of the week, Memory XFR was an opportunity for individuals and organizations to work alongside trained audiovisual archivists from DCPL, the Library of Congress, and NPR. There, attendees could learn the ins and outs of transferring memory-holding formats through hands-on guidance and live feedback. Since there were a limited number of time slots available to use the small number of digitization stations, organizers had interested parties email me, the Memory Lab Network Project Manager, to sign up for 2-hour slots and for further details. Memories were transferred to digital formats consistently throughout the event, 11am through 3pm. There was a drop-in appointment for slides from the 1960s of a family abroad, oversized family photographs, video oral histories of family members long-gone, audio oral histories, and degrading 8mm home movies from the 1930s and 1940s. From 12:30-1:30pm, we held an “Ask an AV (Audiovisual) Archivist Hour”: anyone could drop-in with their questions, have their AV items’ condition assessed, or tweet their questions out to us and get a virtual response from the archivists at Memory XFR (check out the hashtags #AskAnAVArchivist and #MemoryXFR). This proved to be one of the most popular events of the day, with several drop-ins and questions going past the 60 minutes we allotted. As recommended in any DIY and transfer event, we prepared our attendees to expect the unexpected! Old and obsolete equipment is not 100 percent reliable even after testing, and older equipment may also be slower. This turned out to be very true the day of the event: the bulb burned out for the 8mm film viewer (with no spare), and our back-up audio compact cassette digitization station started to add digital errors. To make up for the cassette digitization station malfunctioning, we wired the cassette deck to the photo scanning station and downloaded the necessary software, and successfully turned the photo computer into the new cassette station. With the patience of our attendees and determination of our volunteers, we shifted the work to other machines and were able to assess and successfully digitize patrons’ collections. Despite our initial back-up audio compact cassette digitization station not working, we reconfigured some equipment at the Memory Lab, and digitized the tape! At 3 PM, Michelle Stefano, Folklife Specialist in Research and Programs at the American Folklife Center, taught a free public class about cultural documentation and how to best record oral histories. And lastly, at 4pm, I shared how best care to for your digital photographs to ensure long-term access to your recently digitized or born-digital materials. You can see my slides here. Overall, it was an extremely successful event. One of the biggest takeaways for a successful event is to partner and collaborate with other local organizations. 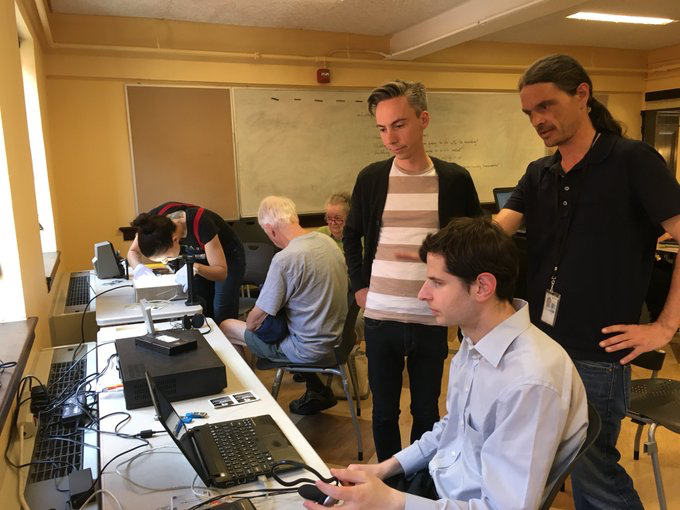 DCPL hopes to emulate this program again in the coming months, both in DC collaborating with the Library of Congress again and throughout the country through the Memory Lab Network. There are now many more library users who are empowered to transfer and preserve their memories, and we aim to multiply these memories in the near future. This is a syndicated post. Read the original at The Signal 2018-10-30.